It’s finally happening: after years of dreaming and talking about it, the garage is on its way to becoming a studio. Once we replaced our old solid garage door with a beautiful, satin-etched glass and aluminum version, the space was flooded with natural light. Next step: clearing out all the “stuff” that gets stored in a two-car garage that we never park in. This led to a domino-effect of household “stuff-shuffling” and a hoot of a garage sale (time to let go of the now college-age daughter’s childhood bedroom set!). When the electrician is finished, we will have a new sub-panel, and four of my favorite fluorescent “cloud” lights (in the stacked boxes, by Maxim). I have been tweaking the lighting plan for weeks, and we are installing extra receptacles in case I decide I want to add track lighting later. I’m hoping I can find low-glare, balanced-color LED bulbs that I can use in my track fixtures. Input welcome! And boring but important: the air-exchange ventilator that will keep me breathing fresh air year-round. Still TBD: I will need heat in the winter, but will I need air conditioning in the summer? The garage door is insulated, but it IS south facing. I may end up with a ductless mini-split air con/heater, but fortunately, this can go in after I have a chance to experience the insulated space. Please share any input if you have installed these or other single-room heating/cooling units. 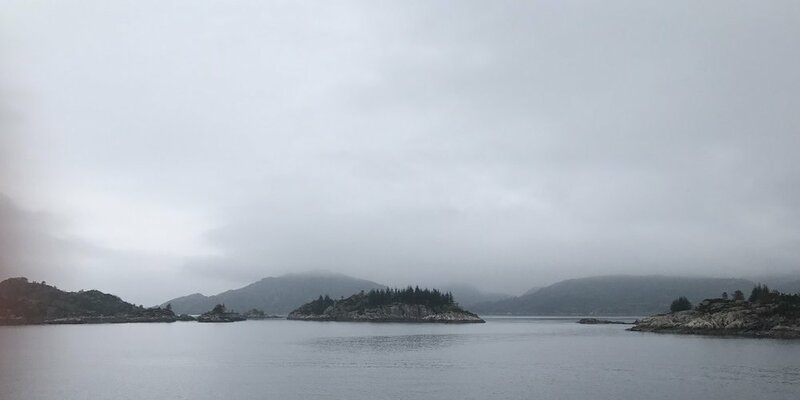 Sognefjord, Norway--or is it the San Juans? Earlier in the spring we had a long trip to Europe, and I gathered hundreds (okay, thousands) of inspiring images from England’s Cotswolds, Sweden’s forests, and Norway’s Fjords. Who knows if one or two will lurk amongst my favorite Northwest landscapes in my next big show (March of 2018). I’ve done a few private commissions since my show last fall, and I always appreciate how much I learn from my clients in these rewarding endeavors. I will be free to take on more commissions starting the summer of 2018. I hope I see you at one of these summer shows, and I look forward to sharing photos of the finished studio in another update this fall, as well as on my Christine Olson Gedye, Fine Art facebook page .